Does Apple not want truly GREEN data centers? Is there such a color as coal-green? This question comes in mind when reading about Apple’s new data center in Denmark. Apple recently announced it will construct two new large data centers in Europe, both to be “run on 100 percent renewable energy”. According to a press release from Apple, “the new facilities will run entirely on clean, renewable energy sources from day one”. These are interesting statements, having in mind that both data centers will be connected to a grid which mostly delivers electricity from fossil fueled power production. 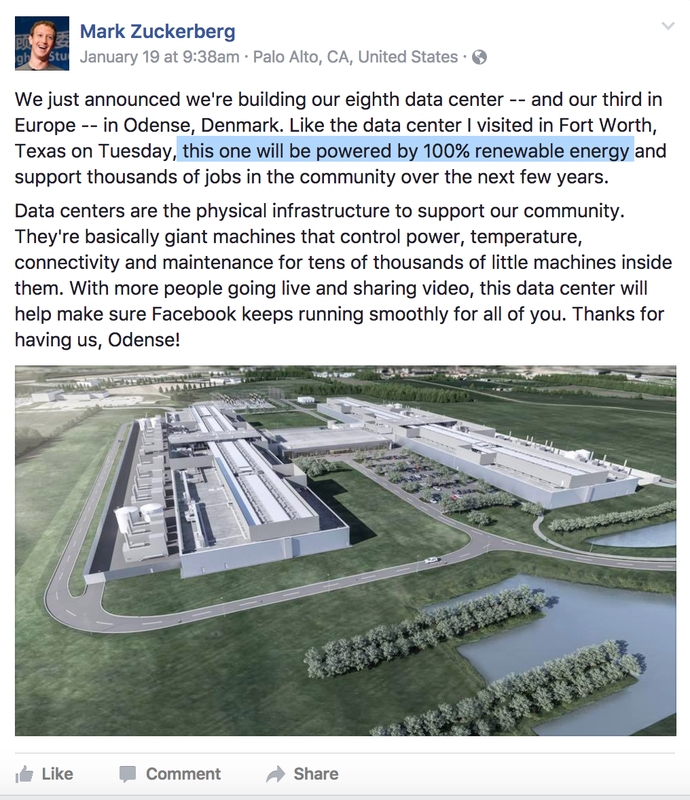 Here we will consider if a data centre located in Denmark can truly be said to run all the time on 100 percent renewable energy. 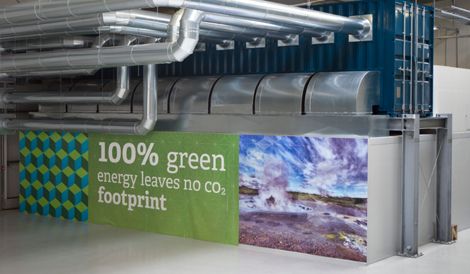 Denmark generates substantial amount of green energy. According to the most recent information from the European Union (EU), the renewable’s share of Denmark’s gross electricity consumption in 2012 was close to 40 percent. 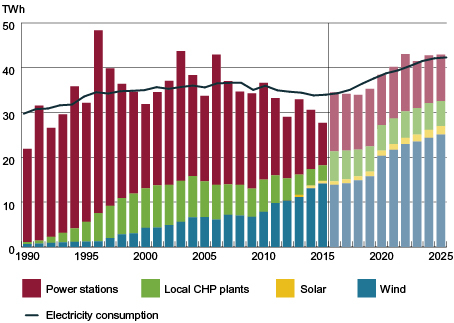 More recent information from the Danish transmission system operator (TSO), Energinet, tells us that the share of renewable energy in 2013 was somewhat higher than in 2012, but still less than half of the total electricity consumption (47.5 percent). Denmark’s electricity is mainly generated by coal. 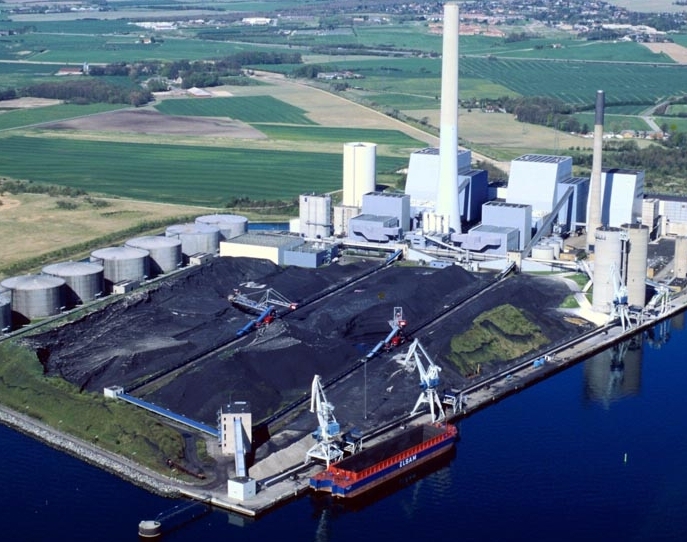 The Danish government has plans to decrease the importance of coal, but coal still constitutes for more than half of the fuel consumption of Danish power stations. Most of Denmark’s renewable energy comes from wind, which is of course somewhat a fluctuating and unreliable energy source. In 2013 the share of wind in the electricity consumption was almost one-third (32.7 percent). Denmark’s electricity grid is not an island, but connected with its neighbouring countries by several large cables. Therefore, Denmark sometimes exports electricity and sometimes imports electricity. 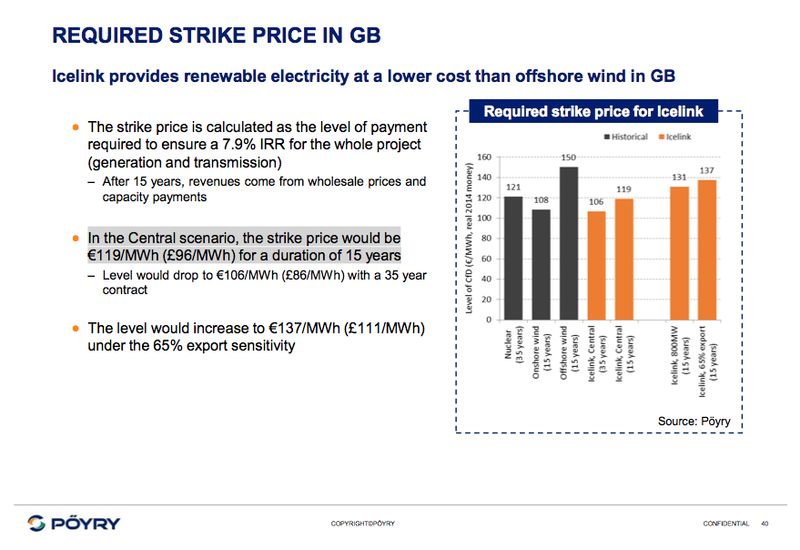 Weather it is exporting or importing electricity depends on the price difference within the larger market area. Normally, Denmark exports electricity during night (because of its large wind power capacity) and imports during the day (when demand goes up and Norwegian and Swedish hydropower stations are utilizing the water in the reservoirs). However, imports and exports of electricity of course always depends very much on how the wind blows in Denmark. When Denmark imports electricity, it comes via cables from Germany, Norway, and/or Sweden. The imported electricity can, for example, be generated by fossil fuels (major coal power in Germany), by nuclear power (nuclear stations in Sweden and Germany), or by hydropower (especially from Norway, but hydropower is also a major source in Swedish power generation). Lately, most of the imported energy has been from Germany (as shown on the diagram at left, which is from the Danish TSO). Coal is the most important source of electricity generation in Germany, accounting for close to half of the generation. In Germany, only ¼ of the generation comes from renewable sources on average. Natural gas and nuclear energy account to close to ¼ of the generation. 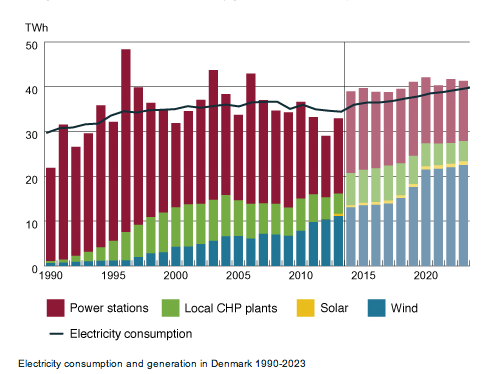 Thus, electricity imported to Denmark from Germany normally increases the share of fossil fuels and nuclear power in the Danish electricity consumption. 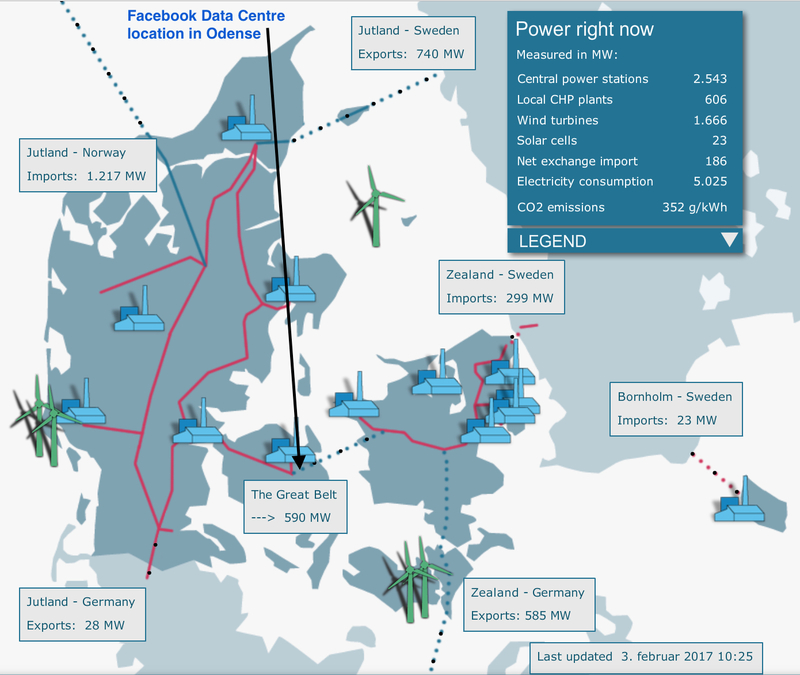 It is highly unlikely that a data centre located in Denmark, connected to the grid. 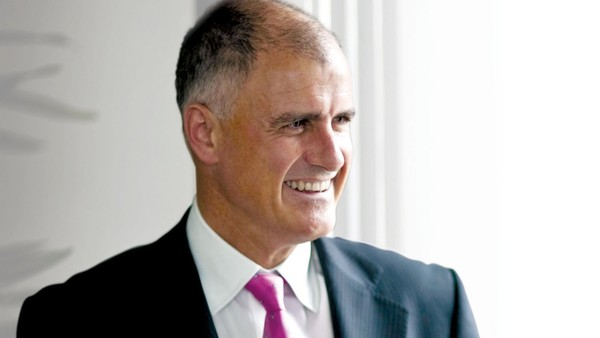 will be run entirely on clean, renewable energy sources only. For the end-user in Denmark it is impossible to know how the electricity he consumes was generated. 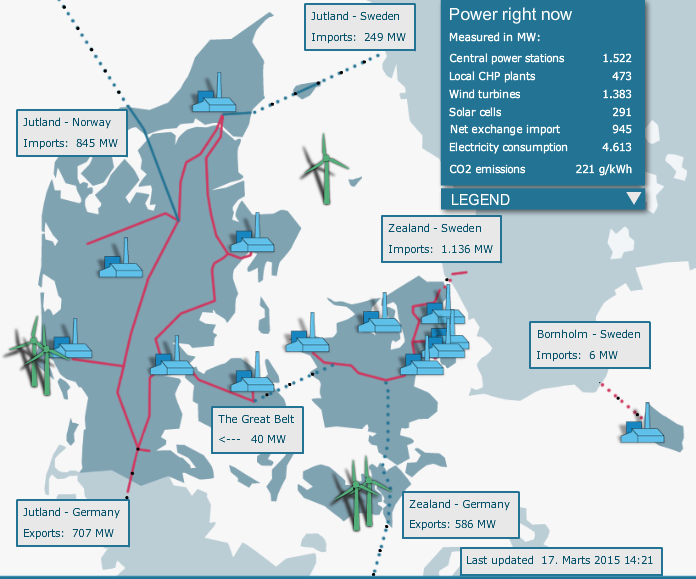 Even more important is that Denmark’s electricity mix is dominated by coal power stations. In fact every date centre in Denmark can be expected to mostly be run on coal power. Of course companies, including those running data centers, can try to find a generating company that only produces electricity from renewable sources and buy its electricity from that company. But the electricity put into the transmission grid can not be isolated – so to speak – from other electricity on the grid. Therefore, it is of course impossible for the buyer to promise that he is only using or consuming green energy. It is possible to buy what is called Green Certificates, which are a tradable commodity proving that certain amount of electricity is generated using renewable energy sources only. However, this does not mean that the electricity being consumed by the buyer of the certificate is from renewable sources – it might as well be from a coal power station or from a nuclear plant. 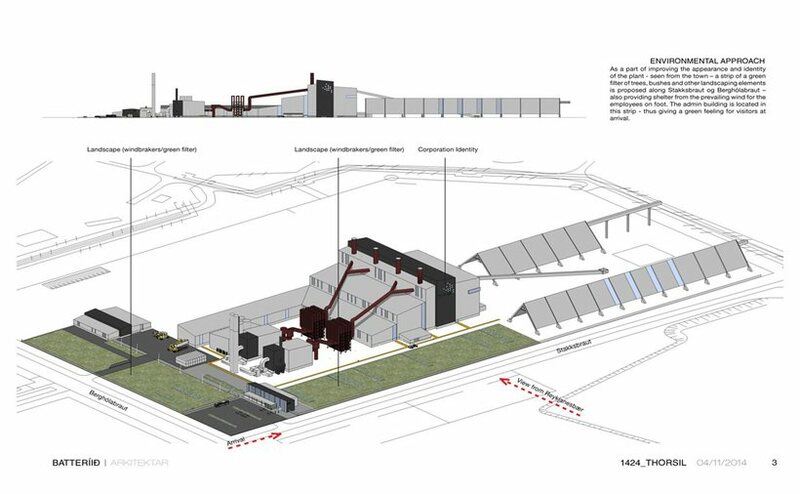 The result is that every data center in Denmark, connected to the grid, will in fact be using electricity from all kinds of power plants, including for example coal power stations. The only way for a major data center being truly able to run on 100 percent renewable energy is to take power from a grid that only delivers electricity from renewable sources. In Europe probably no grid comes as close to this as in Iceland. 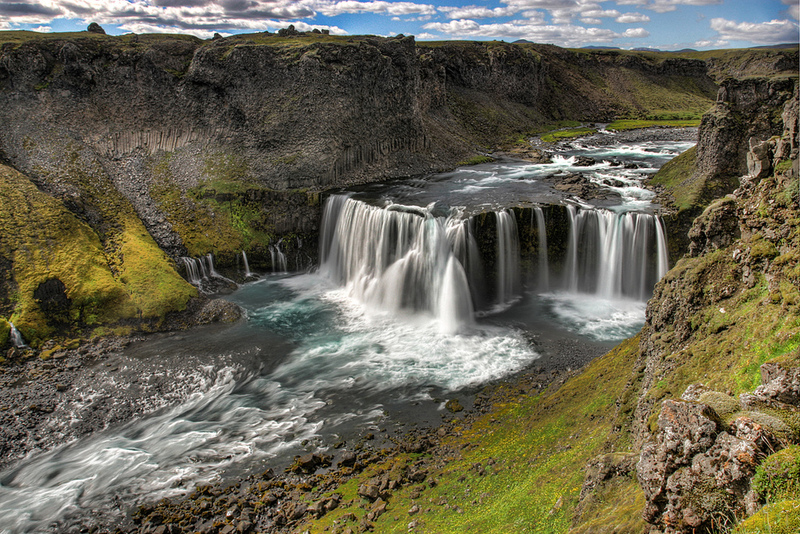 Iceland produces close to 99.9 percent of its electricity by utilizing hydro- and geothermal power (and some wind power). Norway is in a similar situation, producing almost all the power from hydro resources. 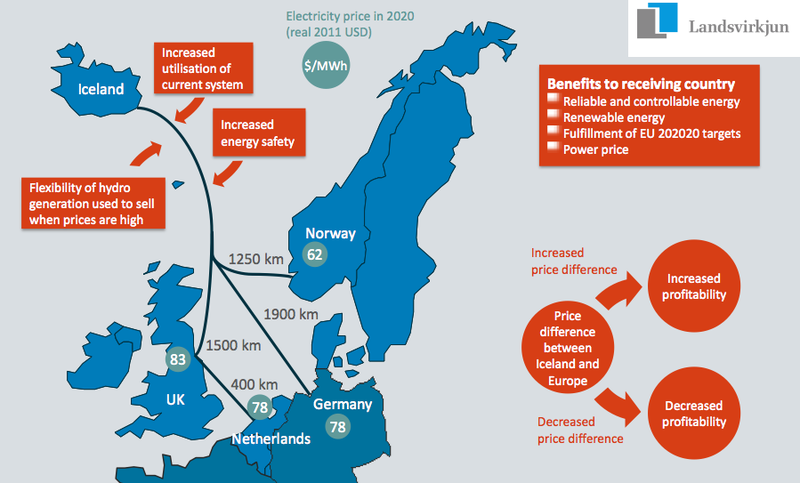 But Norway also imports power from other countries, thus distributing coal power and nuclear power to end-users. So Norway is not quite as green option as Iceland is. Regarding Denmark, it is obviously not a very green option at all. The environmental accounting may tell us that a company there has a very low net carbon footprint, but in reality the electricity is not only from renewable sources at all. 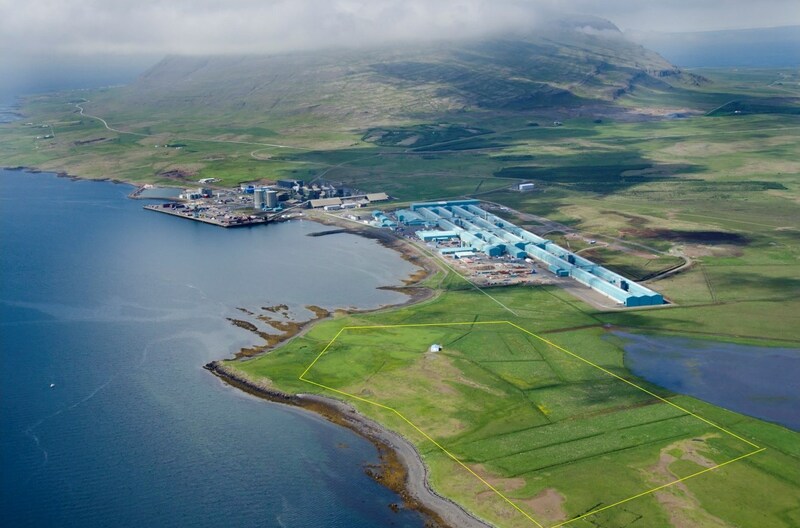 If Apple or any other firm in Denmark wants to run 100 percent on renewable energy it would in fact either have to disconnect from the grid – or set up its operation in Iceland. 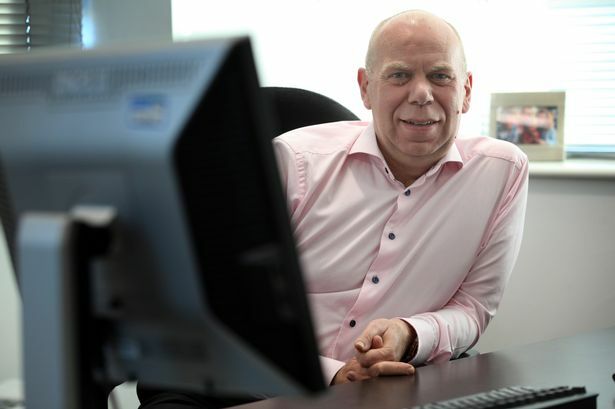 A global panel of independent industry experts has identified a subsea electric cable between Iceland and the United Kingdom (UK) as one of the hundred most inspirational and innovative infrastructure projects in the world – many of which are expected to transform the way the world’s populations interact with their cities, governments and environment. 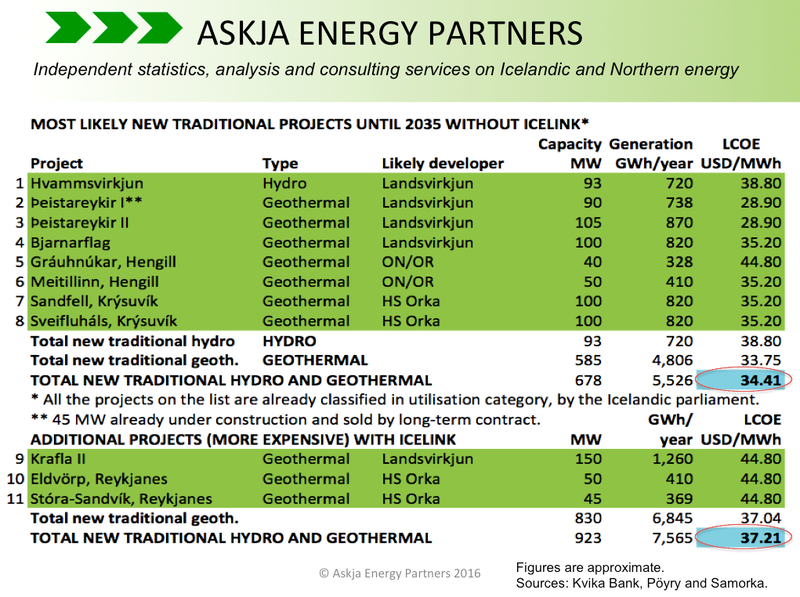 This is the first time that an infrastructure project in Iceland is on this list, which is published by KPMG (download the report as pdf here). 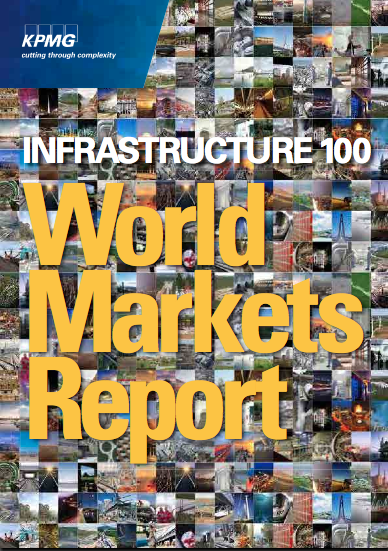 KPMG International’s ‘Infrastructure 100: World Markets Report highlights key trends driving infrastructure investment around the world. In the report, a global panel of industry experts identifies 100 of the world’s most innovative, impactful infrastructure projects. Furthermore, the panel demonstrates how governments are coming together with the private sector to overcome funding constraints in order to finance and build projects that can improve quality of life – both solving immediate needs and planning for future societal demands. The 2014 report focuses on key trends driving infrastructure investment in four key markets, one of the categories being smaller established markets, which are strong domestic markets open to private finance in infrastructure. 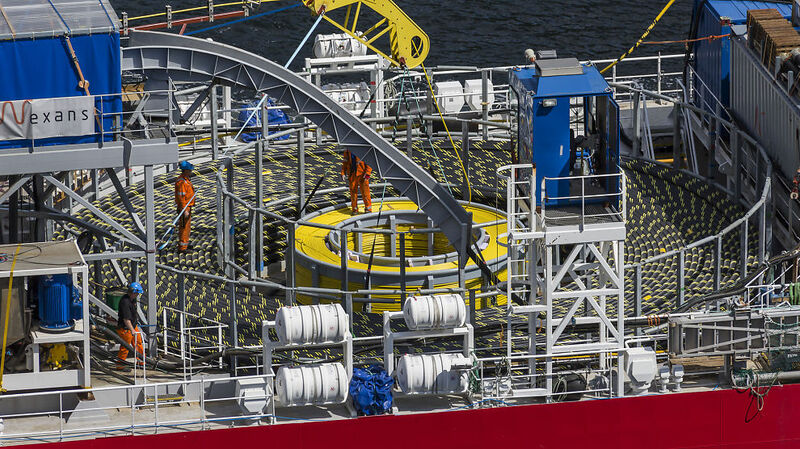 The subsea electric cable between Iceland and the UK is one of 25 projects falling under this market-category. 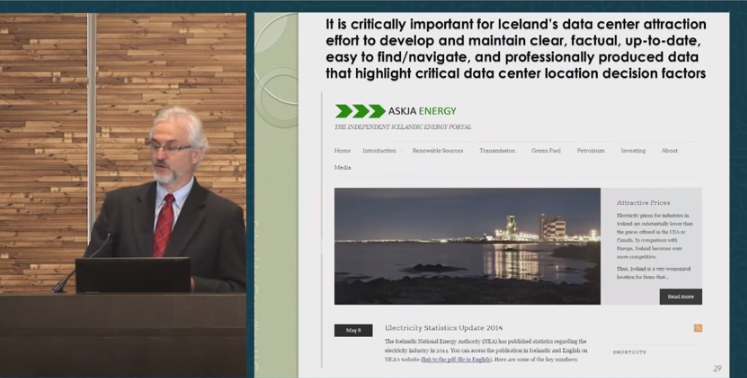 The report describes the project, called IceLink, as an ambitious attempt to connect the power grids of Iceland and the UK. 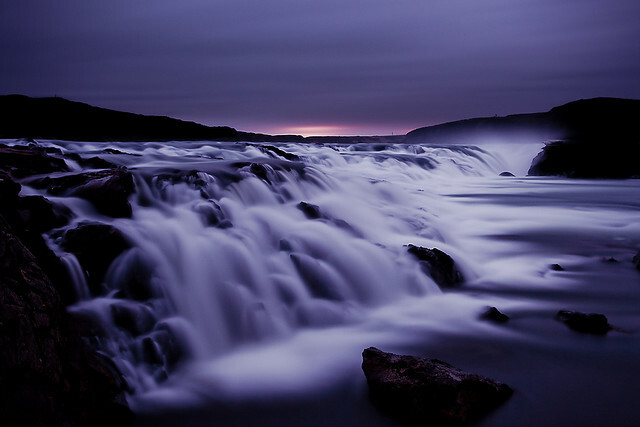 Iceland produces all of its electrical power by the means of renewable energy, such as hydro, geothermal and wind, and has potential well beyond local consumption. Of all the 100 projects listed in the 2014 KPMG-report, 27 projects are in the sector of energy and natural resources. 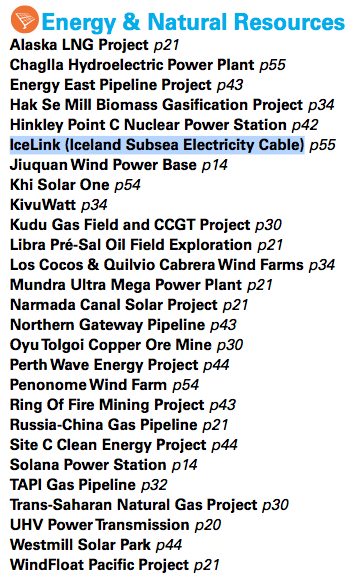 Besides the IceLink, these projects are for example the Alaska LNG Project, the UK Hinkley Point C Nuclear Power Station, and Russia-China Gas Pipeline. A total of 25 projects are classified as being in smaller established markets. 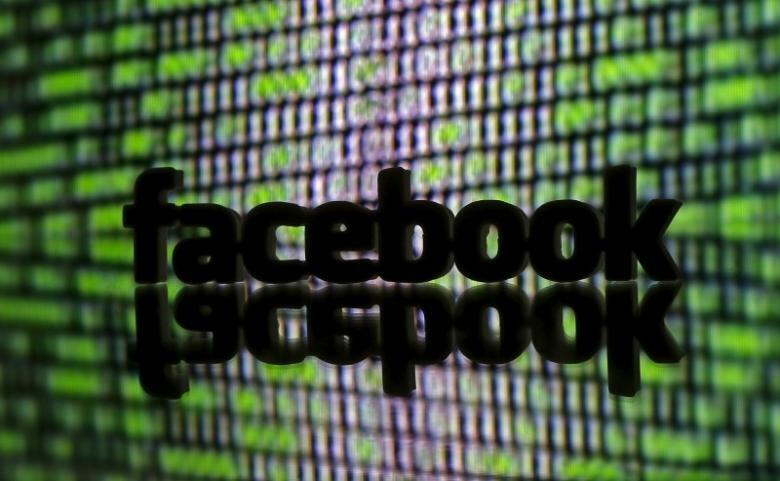 The IceLink is one of these projects – other projects in this category are for example the Facebook Rapid Deployment Data Center in Luleå in Sweden, the Scandinavian 8 Million City High Speed Rail Link between the capitals of Norway, Sweden and Denmark, and the Rail Baltica, linking Finland, Estonia, Latvia and Lithuania with 960 km of railway track. Although many of the projects in this category face challenges regarding scale and investment, KPMG believes there are good possibilities to realize all the projects with increased access of private investment. 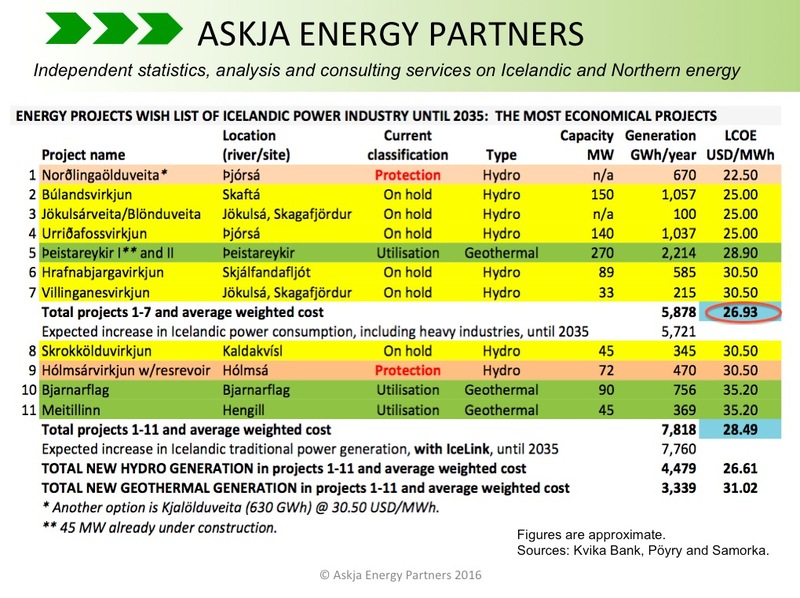 With IceLink in mind, a perfect and realistic business model might be a private ownership of the cable, while the Icelandic TSO and the main Icelandic power firms would probably be in majority governmental ownership, possibly with private investors as co-owners.